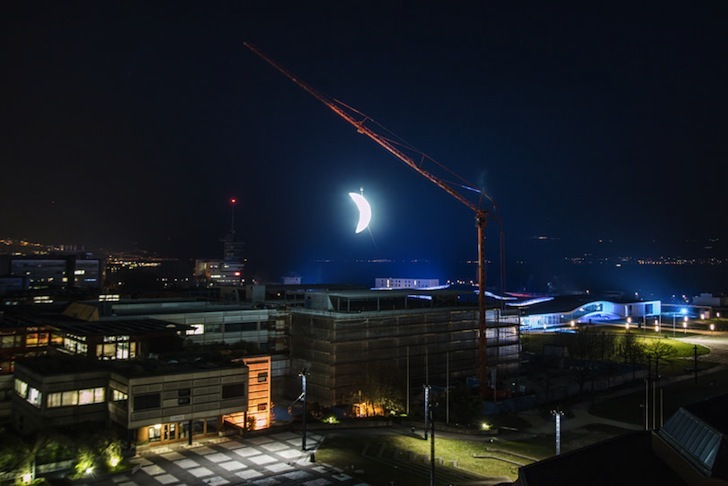 Urban street artist SpY has just revealed his latest urban intervention: MOON, a gigantic luminous artwork suspended above the EPFL university campus in Laussane, Switzerland. The hanging sculpture is built as a waxing crescent to mimic the shape of a moon in its first quarter. A large industrial crane dangles the brightly lit installation above the plaza to call attention to the night sky. Urban street artist SpY has just revealed his latest urban intervention: MOON, a gigantic luminous artwork suspended above the EPFL university campus in Laussane, Switzerland. The hanging sculpture is built as a waxing crescent to mimic the shape of a moon in its first quarter. MOON is suspended in the air with the help of a giant industrial crane.